If you've read my posts where i've reviewed other products from NYX Cosmetics, you will know that I am a fan of the brand. I think it should be more readily available in the UK though. There is of course the online store where you can purchase some goodies. This is my first blush from the NYX Cosmetics range. 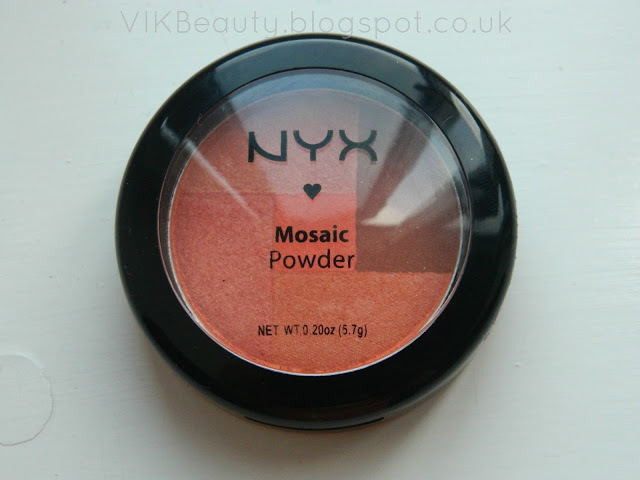 NYX Mosiac Powder is described by NYX as a "medley of five luminizers creates a dazzling glow for every skin tone". There are 12 different shades to choose from. LOVE is a good thing ..(sorry it was too good not to put that in there!). LOVE is a gorgeous shade. It is a medley of coral, peachy, pink and bronze tones with a shimmer to it. When I saw this product, I instantly fell for it as the blushers I usally use have coral or peachy undertones. I think these colours tend to compliment my skin tone well. 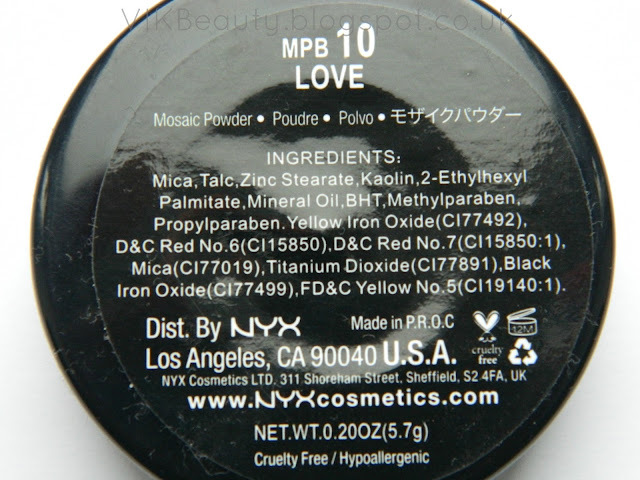 A point to note for those who look out for certain ingredients is that it does contain mineral oil and parabens. However, as mentioned in my previous post, there is still ongoing research in that area, but it is something to be aware of. 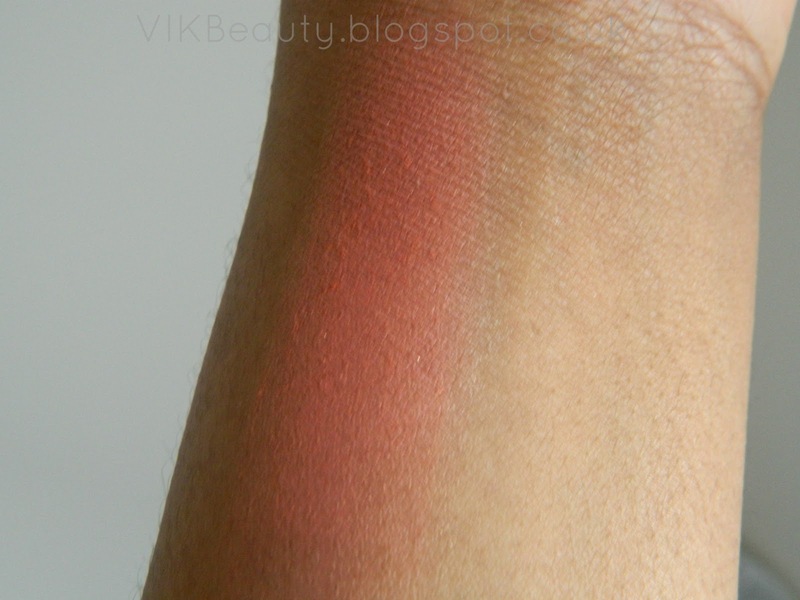 As you can see from the swatch, this blush is extremely pigmented which is great. You really do not need to use that much to get the desired effect. It is really smooth to touch and apply. It feels quite silky. NYX state that the blush can also be used on your eyes and your lips. However, I just prefer to use it as a blush as it is not a cream blush. 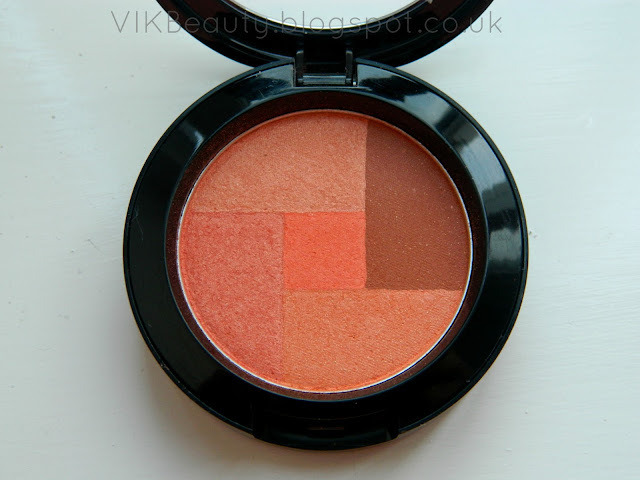 This blush is priced at £6.50 for 5.7g which I think is a reasonable price for such a good product. You can pick this blush up via the NYX Cosmetics online store. Click here. Have you tried this blush from NYX Cosmetics? Which are your favourite blushes from the brand? How would you use this blush on your lips? I understand with the creamy blushes but not with the powdered ones. I love the colour. I've always wanted to try NYX blushes! I've never even heard of this product yet until now! It looks lovely~ kind of reminds me of the blush palette i have--two colors i mix together to achieve that color. I might just pick it up now. @TarteAuxFraises ~ I know, when I read that I was weary. I think probably tapping it over some gloss on your lips! Gorgeous colour! Love that it's a coral with a slightly pink undertone. So pretty!